When I learned how to make apple cobbler recipes I also learned a little about the history of this dessert. Evidently these recipes have variations from region to region; or perhaps I should say from person to person. When I want to eat cobbler, I do not want pie. Some of the cobblers I have seen are no more than a pie with no bottom crust and a thin layer of pie dough over the top of the fruit. This is not cobbler to me. I have seen what is suppose to be apple cobbler and is only apple crisp. I have nothing against apple crisp or apple pie for that matter. I really like both of those dessert recipes but when I want an apple cobbler, I want apple cobbler. Then I have seen those cobblers that have the dough in the pan under the fruit. It never gets quite done from the fruit boiling on top of it in the oven so what you have is a bowl of dough and fruit. The fresh fruit cobblers are some of the traditional American recipes originating back in our original New England colonies. When the new settlers came to the New World starts were brought her for apple trees. This fruit became very important for sustaining the settlers. I think of cobblers resembling “cobblestones” on the top; this sets apple cobbler apart from apple pandowdy or other similar desserts. When I learned how to make apple cobbler recipes, I wanted to learn what I call a cobbler. The first recipe below is what I call a "cobbler". Almost any kind of canned or frozen fruit can be used. Perhaps the peach cobbler is the most popular of the cobbler family, but there is something old fashioned and all American in a good apple cobbler recipe. Fill a large casserole baking dish half full with canned or cooked apples (can use any kind of canned fruit or fresh berries); Add enough sugar to sweeten apples to taste and if desired add a kittle cinnamon. Sift together in a large bowl the flour, sugar, baking powder and salt. In another bowl mix together the cream, eggs and vanilla. Make a well in the center of the dry ingredients and pour in the egg mixture; mix well. Spoon the batter over the fruit spreading it evenly; Sprinkle a little sugar over the crust or crumble a few sugar cubes coarsely over the crust. Bake about 1 hour until the crust is brown and cooked through.Push a toothpick half way through the crust and pull out to test for doneness; if dough does not stick to toothpick the cobbler is done. This is one of the apple cobbler recipes which calls for pie dough over the top. Place apples in a pan; sprinkle the salt, cinnamon, sugar, nutmeg, lemon rind and lemon juice over the top of the apples; dot with the butter. Top with a rolled pie crust and bake for 1 hour. 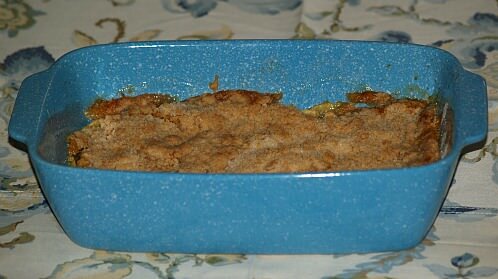 The following is one of the apple cobbler recipes which reminds me of apple crisp. Combine the apple slices, water, ¾ cup sugar and the rind in a saucepan, bring to a boil and boil 3 minutes. Place the apple mixture in an oven casserole dish. Combine the remaining ¾ cup sugar, flour, salt, cinnamon and baking powder; cut in the butter until the mixture is crumbly. Sprinkle the crumbs over the fruit and bake 25 minutes or until brown. 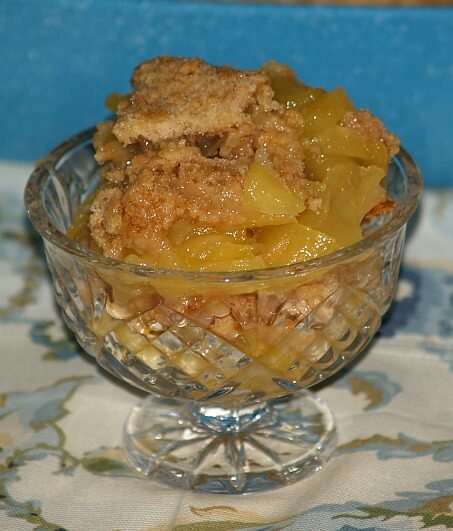 This is one of the apple cobbler recipes conveniently assembled by using canned fruit and a recipe of biscuit dough; for a really easy cobbler recipe use canned biscuits. Pour cans of filling into a casserole baking dish. Combine sugar, cinnamon and nutmeg; sprinkle over top of apple filling. Dot top of sugar mixture with small bits of butter. Layer biscuits over the top. Bake in preheated oven at 375F degrees for 30 minutes or until biscuits are golden brown and done.